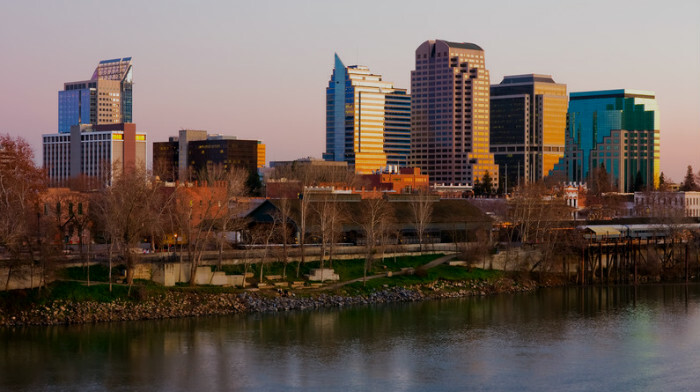 Is 2019/2020 looking strong for the Sacramento housing market and Northern California? Consensus is yes. Despite the easing of the market, it may be hurtling at top-speed toward peak San Franciscification as one report has it. The US and California economies look good and with President Trump pushing for fair trade agreements, it can only produce more GDP growth, upward wage pressures and further reawakening of the American dream, long since abandoned in the last 11 years. 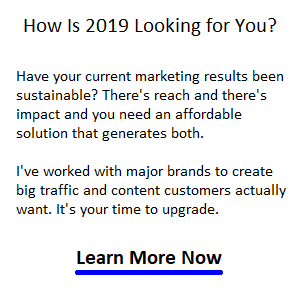 And even with NASDAQ and multinational corporate tech threatened in 2019, Silicon Valley is still the lightning rod of the American revival. The California housing market will keep thriving. Yet, there are other ways to view the Bay area outlook. Are persistent regulations, interest rates, or the natural tail end of the housing cycle harbingers of doom? Could Sacramento’s market collapse in a larger national or California housing crash? Experts are torn in their predictions because there are so many conflicting factors affecting all US housing markets from Los Angeles and San Francisco to Boston and Florida. The rising prices are the result of higher demand and low housing availability almost everywhere. And California is where the housing crisis is worst. Residents don’t want the inflation, immigration, higher taxes, congestion, pollution, water shortages, and crime that new developments might bring. In fact a report in the San Jose Mercury News suggests California politicians are failing to approve housing development initiatives. That translates to higher home prices and apartment rental prices for 2019/2020 and beyond. Some suggest these nationwide trends will drive all markets from 2019 to 2020 — the demand in Sacramento County was just delayed. Is Sacramento worth it? It seems the lower prices is all that matters to most, however this area has a warm charm and excellent climate that many residents could never think of letting go of. The desperation of Sacramento residents is pushing them north to Yuba City and Sutter County to find bargain houses for sale. Lifestyle factors, lack of availability, and affordability issues will drive home sales in Yuba City, Sutter County and other towns outside of Sacramento, and it’s worth a look up north. 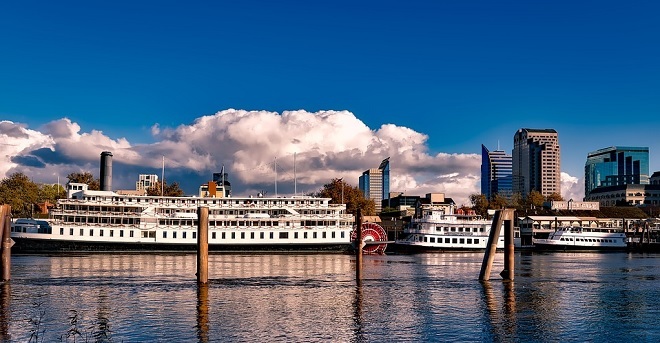 Buyers from San Francisco and the Bay Area are still eagerly checking out Sacramento for bargains themselves. Realtor.com reports only 2770 homes are for sale on the MLS in Sacramento, a county of 2.4 million people. 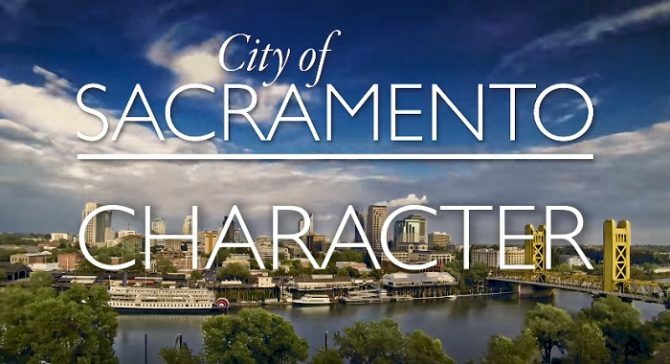 Sac was the fastest growing city in the nation last year with a growth rate of 1.4% which accounts to a whopping 33,000 new residents. Zillow reports that 89% of homes in Sacramento increased in value whereas only 7.4% of homes decreased in value. The monthly rent index grew 8.2% in the last year showing rental income property investment and speculation may be adding to the price pressure. For renters, who seek relief from $4,000+ rents in San Francisco, the $1500 price tag in Sacramento is alluring. The current average home price in the city is $323,000 while Elk Grove and Roseville are priced at averages of $421,000 and $438,000 respectively. To someone cashing out of the market in San Francisco, even these rising prices are very attractive. 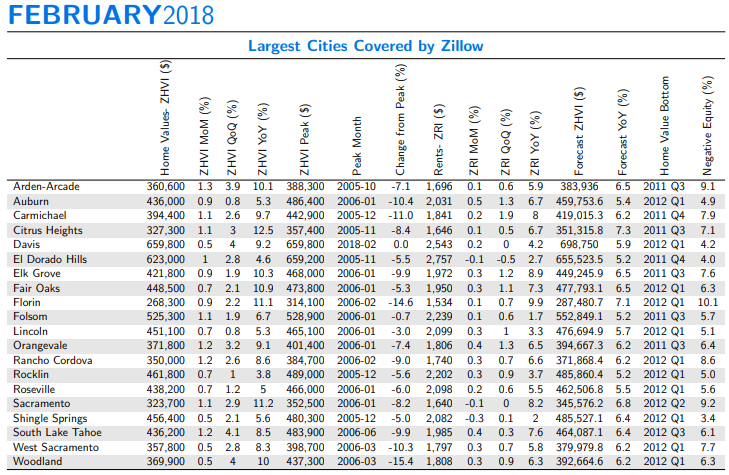 This excellent chart agove from Zillow reveals exceptional price growth in Citrus Heights, Elk Grove, Fair Oaks, Florin, Orangevale, and Sacramento. El Dorado Hills and Rocklin recorded the lowest rates of price growth. Realtor.com rated Sacramento as the 5th hottest housing market in the nation in February 2018, up from 8th spot in January. 14 of the top 20 were California cities. And the forecast for the state of California remains hot, including San Diego, San Francisco, San Jose, and Los Angeles. A report in the Mercury news shows demand for homes in Sacramento is coming from the Bay Area. One estimate is that 120,000 Sacramento residents work in the Bay Area. This makes this new mega region very attractive for all sorts of innovative living and working solutions. This chart of home prices in Sacramento neighbourhoods, courtesy of Trulia, indicates those with the most intense demand from buyers. Take not of those in bold font below that have experienced the strongest price growth. Ask your realtor what are the keys to this jump in prices. Sacramento County is one of the hottest housing markets in 2018. If you’re an investor, you have to take this market seriously. With home prices at one third of neighboring cities in the Bay Area and 300,000 new residents in 2017, within a strong economy, there’s opportunity. Please do Bookmark and Share this post. It will be updated frequently with new stats and expert opinions.